Ayurveda Massage Table - What is Ayurveda? BestMassage.com, the international massage table and supplies warehouse, has released a new Ayurveda BodyChoice massage table designed to “catch” massage oil and prevent oil spills during massage therapy. Chicago, IL, September 5th, 2011– Using massage oil during therapy can make things messy. Massage oil drips and pools and if you’re not careful, it can end up on the floor creating not only a mess, but a safety hazard as well. BestMassage.com has come up with a solution for keeping massage oil contained and making sure that it doesn’t end up on the floor—The Ayurveda BodyChoice massage table. 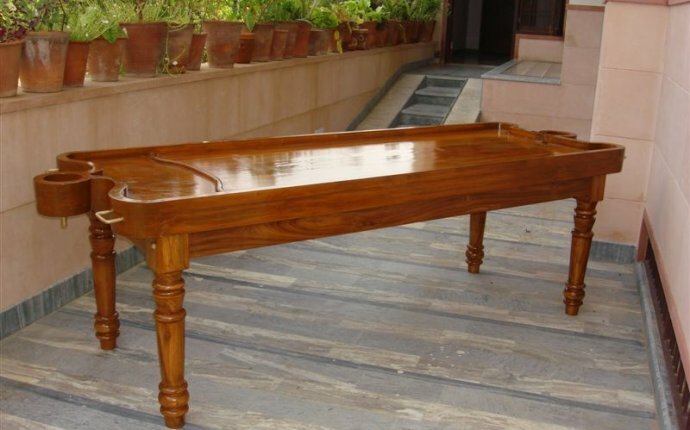 This massage table, named after the centuries-old Indian medicinal tradition, has raised edges all along the perimeter of the table. These edges keep oil on the table and away from everything else. Ayurveda in Sanskrit means “knowledge of life.” Its origins date back to the Vedic period, around 1500 BC, in India. Ayurveda is a medicinal tradition that focuses on balance, specifically on three elemental energies, or Doshas. According to the ancient practice, if the Doshas are in balance, the body is healthy. If not, disease and illness follow. One way to keep the body in balance in Ayurveda tradition is through oil and massage. The Ayurvedic practitioner pours large amounts oil, usually sesame seed oil which is very thick and is purported to contain several healing properties, directly on the client. One of the element s of Ayurvedic massage is known as Shirodhara, or the pouring of a constant stream of oil onto the forehead of a client. “You can imagine the mess that can create, ” laughs Buechler. BestMassage.com came up with a unique solution for handling that mess, too, with its Shirodhara face pillow which is included free with the Ayurveda massage table. The Shirodhara face pillow actually forms a spout from which oil can drain into a container positioned underneath. “Ayurvedic massage therapists would love our Shirodhara headrest. It is comfortable and extremely practical, ” says Buechler. The Ayurveda BodyChoice massage table is available online at BestMassage.com only for $239. It is 32 inches wide and features a Shiatsu cable release which allows the practitioner to fold away the table's legs and work with their clients directly on the floor. The massage table comes with free massage accessories like a standard headrest, a standard face pillow, a Shirodhara face pillow, a matching color oil-resistant cover, arm shelf and a standard carrying case.